A word cloud is a cool way to present data, and they can be created really easily with free tools like Wordle. 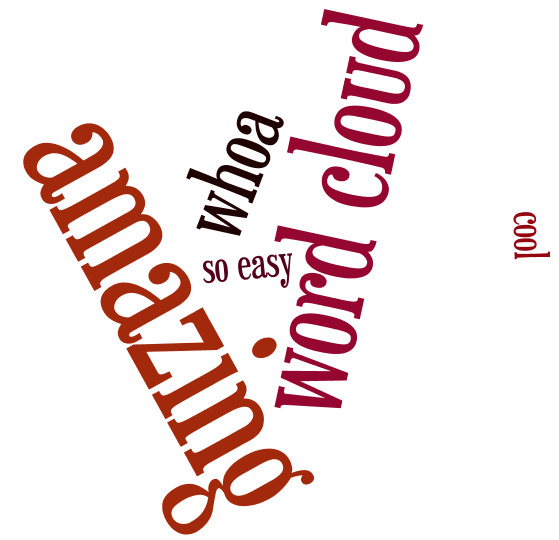 Word clouds are typically generated by analyzing text for the frequency of words and phrases. More frequent words are displayed in a larger font making it easy to identify themes. If you already have text for the word cloud, that’s great — just copy/paste it into the tool and click generate. You can “engineer” a word cloud by simply repeating words and phrases. To adjust the appearance of the generated word cloud, most tools have some sort of style randomizer. I typically randomize until I find something I like. The above example was generated by using the following text. Note that “~” can be used to chain words together into phrases. Is it possible to create this word cloud in a custom shape? Secondly, can a jquery overlay be opened on click of a tag?